On Monday I listened to a fascinating talk of interest to me as a writer, an educator and as a history geek. 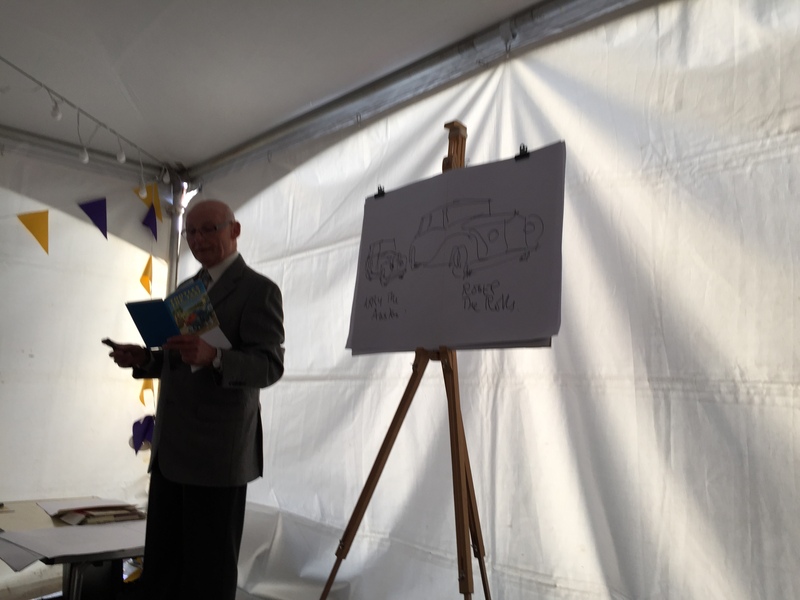 Part of the Loogabarooga Children’s Illustrated Literature Festival, the talk was given by Roy Smith, a brilliant artist who worked his way from apprentice to Art and Production Director at Ladybird Books during the time it was based in Loughborough. Roy illustrated his story with quick-draw sketches very evocative of the Ladybird style I knew as a child. Roy’s quick-draw illustration of his car in the Angel Works’ car park beside the boss’s Roll-er, explained in Tootle the Taxi-style verse. Which brings me to fact number one: there’s a surprisingly huge interest from adults in vintage Ladybird titles. I suspect this is because the books act as a reminder of happy, childhood times. People came from all over the place for the talk and for the previous Friday’s vintage book swap, and many could name their favourite Ladybird book and when and with whom they used to read it. Wouldn’t it be wonderful if one day in the future some adult or other looked back on reading my books with such fondness and nostalgia? Fact number two: it’s now much easier to produce a picture book than it was even ten years ago. My grandfather was a printer, and some of the processes discussed reminded me of my dad’s stories of watching Grandad Edgar at work. Roy mentioned laboriously copying artwork by hand to transfer it to printing plates, hours spent setting out tiny metal letters with tweezers, the need for huge, individual rollers for applying each separate colour and how thousands of book sheets had to be printed off at a time and stored in the warehouse, ready to fulfil any sudden demand. Now-a-days we have the ability to scan drawings, manipulate them on computer with a graphics package, change font with a click of the mouse and print out quickly on modern, efficient printers. It’s possible to produce a book in a matter of hours and, with print on demand techniques, to run off as many – or as few – as are immediately needed. How Ladybird books were laid out on the page so each could be produced from one sheet of paper. 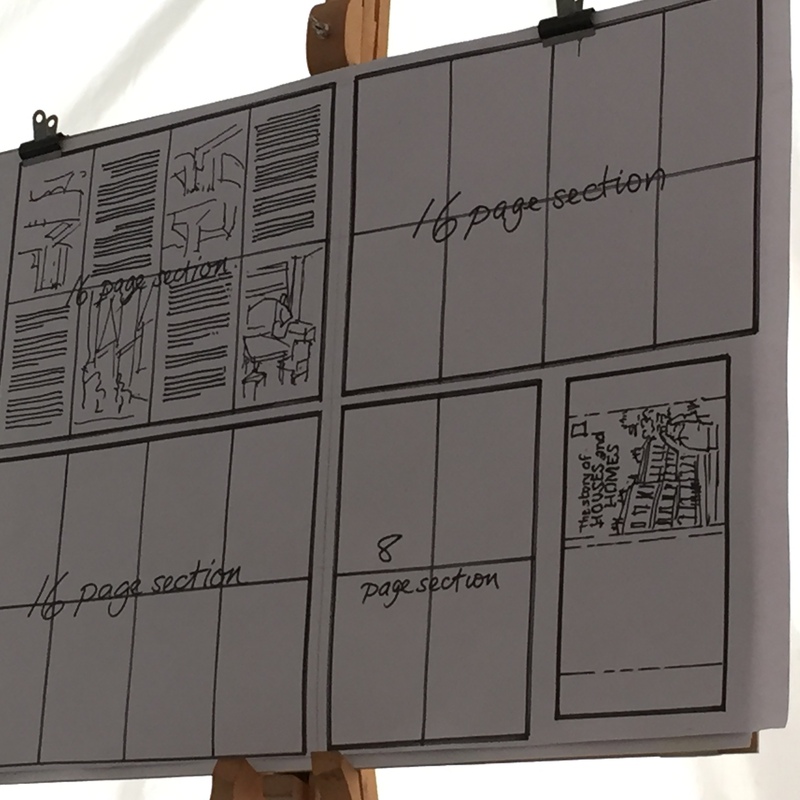 Roy stated several times how difficult it was to make layout changes to books in his day. This made me smile as I’ve just spent two weeks on the computer working on a picture book of my own. Facebook posts document my frustrations with the unfamiliar graphics package I’m using. I had thought myself very hard done by. Listening to Roy, though, I’ve changed my mind. Roy’s talk was the last event in the Loogabarooga programme and after the excitement of the festival, I’m back on the computer, tweaking illustrations and adapting pages so that text fits around them as it should. I’m cutting it fine for having physical copies ready for the ‘window of opportunity’ I’m aiming at, but I’m hopeful to make e-book publication at least, and for the satisfaction of knowing that at long last, my story is out there. It’s all a bit of a gamble, I know, but you never know what’s possible until you try. A hundred years ago last year a little printing company called Wills & Hepworth took a bit of a gamble on putting out a children’s book. It was a real privilege to hear Roy Smith tell the story of how well that gamble turned out. Previous Why support International Literacy Day?